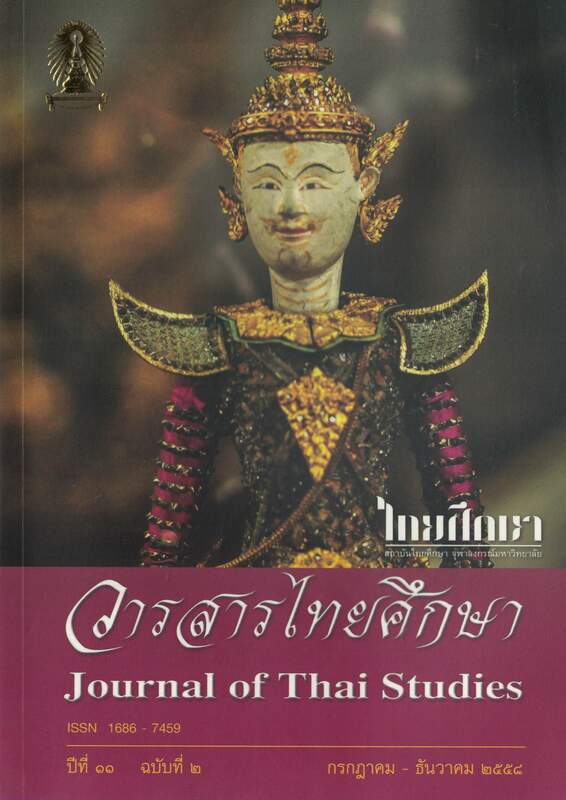 This article aims to analyze the concept of “civilization as” reflected by the representation of the identities of “State Temples and Palaces” on Rattanakosin Island from a documentary work entitled “Exploring Bangkok through archaeological tour” of M.C. Phunphitsamai Ditsakun. This book is the first Bangkok tourist guide influenced by conventional concept of civilization produced by the Siamese court that aimed to change Thais’ viewpoint “State about Temples and Palaces”, from being sacred spaces to being the center of Buddhist civilization. It is clear that this book is the exemplar of how civilization knowledge was constructed through the lens of an elite scholar in the early Bangkok tourism period, as well as the beginning of Bangkok tourism based on academic knowledge. The study reveals that the concept of civilization is a conventional concept appearing in Thai elites’ works which has been used through times. In such a context, Buddhist Civilization is a prominent aspect of Thai civilization appearing in this sort of work. The image of Bangkok as a “Buddhist City” is the outstanding image in this book. The significance of Thai Buddhism in this term is portrayed as a tool for creation of Buddhist city and the establishment of state temples for learning by Thais. The identities of Buddhist culture are represented by the narration of the historical backgrounds. of state temples, palaces, and Buddhist architecture. The characteristics of Buddhist arts also portrays the continuous Buddhist civilization of Thai kingdoms from Sukhothai, Ayutthaya to the Rattanakosin period. In relation to current global challenges, local product development is now considered a vital economic driving force for Thailand. At the same time, design plays an important role in marketing success, from branding, to packaging, and to other aspects of new product development. However, as community products are often made from finite resources and through inefficient modes of production, this scenario may cause long-term negative impact on the community, especially including the exploitation of cultural and ecological values. This article aims to demonstrate the participatory design process employed in local product development through a case study of The Sugar Village, Pak Nam, Bangkhla, Chachoengsao Province. Various key aspects of sustainability – social, cultural, economic, and environmental – are taken into consideration. This article aims to analyze and explain the evolving meaning and function of the Poysanglong Ceremony in the Tai Yai community, which has undergone social and economic transitions from the traditional period up to the present day. The subject of the study is the Tai Yai community in Muang district, Maehongson Province. The study finds that, in the traditional period, the Poysanglong Ceremony served such purposes as: signifying the Tai Yai people’s beliefs in Buddhism; providing means to education and occupational skills training for Tai Yai males; and establishing social relationships and cohesion within the Tai Yai community in Maehongson province, whose livelihood depended upon agriculture, forestry and trade. With the evolving socio-economic environment, the meaning and function of the Poysanglong Ceremony has also undergone transformation. At the present day, the Ceremony mainly functions in the following ways: catering to the emerging trends of localism and nostalgia among the Tai Yai people; to promote local tourism; strengthening the consciousness of the ethnic identity of both the local Tai Yai people and the Tai Yai migrants; and creating new forms of social relationships which correspond to the changes in modern society. In the traditional era, the city identity of the Lanna Kingdom consisted of three essential aspects – King, Buddhism (or Brahmanism) and Spirit. The Lanna Kingdom had a systematic management of city identification through the institution of the King by considering the visual identity, together with physical identity, with the center of the city called Khum Luang Hor Kham Kaew. The kingdom separated the city areas to be many districts. For the Buddhist or Brahmin system, important temples were built as components of the city; for example, Ming Mueang temple, Hua Khuang temple, Si Mum Mueang temple and Luang temple in each city in the Lanna Kingdom. For the important relics in the city or in the kingdom, there were systems of management by following relics birth years, systems for worshiping the relics of five god kings, and systems for worshiping the relics that were kept in temples that were locate at the four corners of city, called the Si Mum Mueang or the Si Chom Relics system. Construction and location of relics district temples or Buddhist/Brahmin districts were on mountains and important areas in the kingdom. For the spirit system, there was a gradation of spirits to control and cover each community level in the city. There was also a spirit systems to protect each corner of the four directions of the city, as well as guardian spirits for protecting inside the city and important areas in the city, such as a pillar (called Inthakhin Pillar), even including old trees in the city.